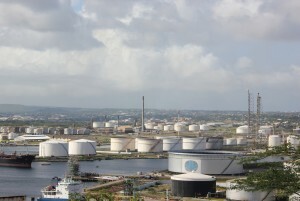 WILLEMSTAD - Petroleos de Venezuela SA, which relies heavily on U.S. oil to run its refinery in Curacao, canceled plans to import American grades in April and May as sellers demanded payment ahead of delivery. The price was right, but parties couldn’t agree on the payment conditions, according to people familiar with the situation. PDVSA typically offers to pay after cargo delivery or makes the payment with oil products and crude. PDVSA was planning to buy 3.5 million barrels of West Texas Intermediate and Domestic Sweet Blend for its Isla refinery in Curacao. As PDVSA refineries are struggling to raise oil-processing due to breakdowns and lack of maintenance, and the country’s oil production fell by a third from a year earlier in March, suppliers are increasingly demanding payment upfront and in cash, the people said. The Isla refinery, which used to process Venezuelan light oils, switched to imported supplies as production in Venezuela slumped amid lack of investments, triple-digit inflation and a humanitarian crisis. In 2017, all of Isla’s imported oil came from the U.S., or 15,000 barrels daily, according to the Energy Information Administration.